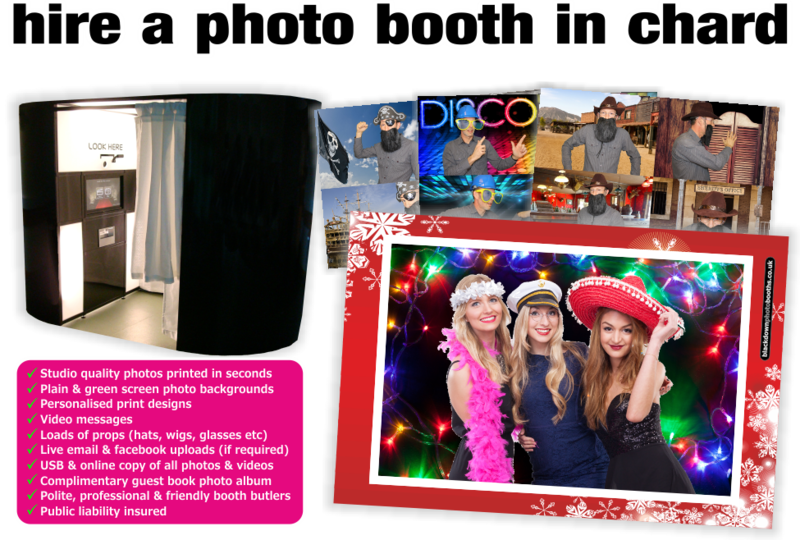 First choice for Photobooth or Photo Booth Hire in Chard. We are a family run business with over 15 years experience in the leisure industry and pride ourselves on supplying quality equipment combined with a professional, prompt and above all, friendly service. Whether it's a birthday, wedding, anniversary, christening, party, school prom, reunion, product launch, brand promotion, corporate function or fundraising event, our photo and video booths really do give you memories you can keep forever. Our Photo & Video Booths are fully touch screen operated and use top of the range Canon DSLR cameras to take your photos, then professional Mitsubishi dye sublimation printers to print them in ‘Studio Quality’ seconds later. In addition to taking stunning photographs, they can also record video messages of any length. All of our Photo & Video Booths can be fully personalised by our in-house designer, allowing your own message or branding to be placed on the photo booth touch screen, the background to green screen photos, or on the final print itself. Better still, our Photo Booths are completely social and subject to a suitable connection, you have the option to email or upload your photos directly to your Facebook page or an album on a business page during your event. For memories you can keep forever, contact us today on 01823 254404 or simply complete the enquiry form on our contact page - we look forward to hearing from you.